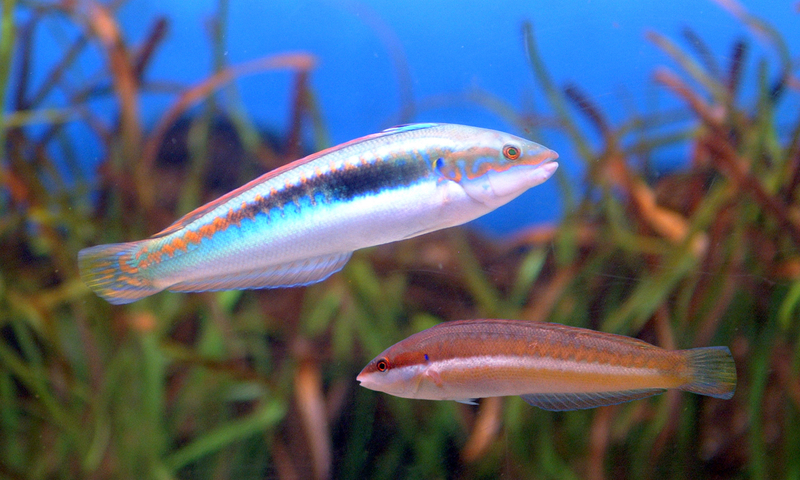 The rainbow wrasse is a fish with an elongated, bony body, slightly compressed, a long head with a short beak. It has two colourings, one for the females and young males and another for the adult males (sexual dichromatism). The young individuals and the females are reddish brown with a yellow transversal line, flanked by two white lines and a white belly. The males’ backs are blue-green and they have a white or yellowish belly, with an orange transversal line in a zigzag. Its maximum size is 16 cm in females and 25 cm in males. The adult males are solitary and defend a fairly broad territory where several females and and young males live. They are active by day and are buried in the samd for the night. They feed on crustaceans, worms, equinoderms and molluscs, and are therefore carnivores. It is an oviparous species that reproduces from May to August. The spawning occurs after a nuptial halt in which the male and female rise vertically alongside each other some 3 cm on the bed, making contact and releasing the ovules and sperm; they then return quickly to the bed. The eggs are pelagic, although the fish is benthonic. This is a highly abundant species that might live equally on rocky beds and in meadows of Neptune grass. It lives at depths of between 1 and 100 m, although it is more frequent in shallow waters. It is found in the Mediterranean and the eastern Atlantic, from Guinea to the Bay of Biscay. This species is a hermaphrodite. When they are young they are male and after a certain time they become males with a brighter colour.